Boulevard's Tank 7 Farmhouse Ale is billed at a saison, but that is a style I've often found too delicate for my taste. 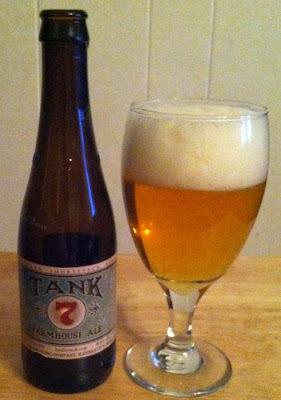 This beer is strong and rich and dry, the 8.5% ABV is a big presence in the flavor and the nose. It pours a hazy orange/grapefruit color with a lot of head, and the smell is spicy and Belgian. Lots of fruit. Bananas and grapefruit in the flavor, more of that spice, and then a strong, dry, very bright finish. Strong vapor after the sip. I liked this.